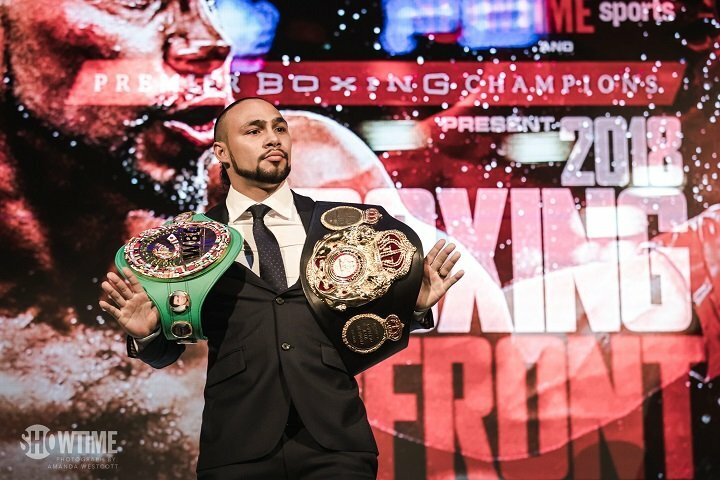 By Mike Smith: Keith ‘One Time’ Thurman says he’s healthy once again and ready to make an announcement for his next fight in a “few weeks” from now for his comeback fight later this year. Thurman (28-0, 2 KOs) has had an injury problem with his right elbow as well as a bone bruise to his hand. Both problems have cleared up, and he’s waiting for the approval from his doctor to return to the ring. Despite Thurman’s injury problems, he states that he’s still the No.1 welterweight in the division. Thurman says that Errol Spence Jr. is No.2. The boxing public would disagree with that opinion. Spence is now viewed as the No.1 welterweight, Terence Crawford #2 and Thurman #3. If Thurman continues to have injury problems, it’s likely that he’ll be surpassed by newly crowned World Boxing Council welterweight champion Shawn Porter. He defeated Danny Garcia by a 12 round unanimous decision last Saturday night to win the WBC 147 pound title at the Barclays Center in Brooklyn, New York. The 29-year-old Thurman will be taking it easy in his next fight, as he’s been out of action since 2017. Thurman has already vacated his WBC title, but he still has his World Boxing Association 147 belt. The WBA has been very, very patient with Thurman in letting him sit inactive for 18 months without defending his WBA belt. It’s been a real negative for the top contenders in the WBA’s top 15 ranking that have been waiting for Thurman to resume fighting again, as he’s frozen his title and the contenders have had to sit and wait for him. “In a few weeks there should be an announcement,” Thurman said to fighthub. “I’m looking forward to getting the good news from my doctor, which is the green light from my doctor real soon, and then we’ll be looking for a date and an opponent for negotiations. Hopefully in less than a month you’re going to hear something you like,” Thurman said. Thurman needs to ease back into training slowly this time, because when he tried to come back earlier, he suffered a hand injury. He’s become brittle and injury prone since 2016. If Thurman continues to suffer injuries at the rate that he’s been doing, then it’ll be difficult for him to stay sharp. “During the Danny Garcia training camp, I had an MRI that I had bone spurs in my right elbow,” Thurman said. “I had a couple of injures to my right elbow. I know his pride told him that he threw a left hook that injured my elbow. That’s super false. As Donald Trump says, that’s false news. The recovery did take one year. It feels fine. I lost a little bit of range of motion. When I got back to camp, we ended up getting stuck with a hand injury. It’s called bone bruising. It’s one that doctors don’t have a simple fix for. Once again, it put me on the bench. My motto hasn’t changed. I got an O and I’m not afraid to let it go. Once I get back in the ring, there’s only one direction to go in and that’s right back up I am ranked #1. Everybody does want to fight me. I look forward to getting back in the ring and reminding people who ‘One Time Thurman’ is,” Thurman said. Thurman’s comeback opponent is likely to be a fringe contender. There have been rumors of Josesito Lopez being the one that Thurman will be facing, but it’s unclear if he’ll be willing to face someone even that good given how much time that he’s been out of the ring. Thurman needs someone that won’t push him to fight at full capacity because he could break down again with a new injury, and then wind up sitting out of action for another year.